Whoa, another fanfic reading day hahahaha, i was reading Full Metal Panic, Noir and Azumanga Daioh fanfics this afternoon, manz some of them were so nice!! Hahaha... Here's tonight's screenshots, Naruto Ep124/125 combined! 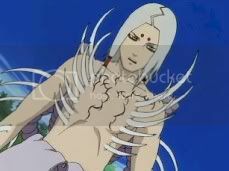 Yeah, i think all Naruto eps screenshots will be either 2 in one or 3 in one hahaha ... Why? U say. I dunno too. Maybe it's too much action i have to lower my standards hahaha ... my standards are pretty high ya know. 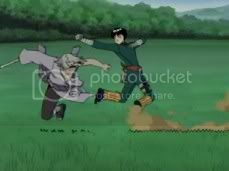 XP Anyways, ep 124 is abt the fight between Kimimaru and Lee, with Lee kicking in the "Sake" and using the drunken fists on Kimimaru. 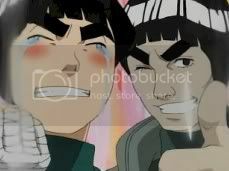 Hahaha it's so funny to see Lee crying "GAI-SENSEI!" hahaha, then the sparking "pint!" haha ... so funny. At the end of ep124 where the Lee, Shikamaru, Kiba are losing to Kimimaru, Tayuya and Sakon/Ukon respectively, the Shinobi of the Sand came to the rescue! Ep125, Kankuro fighting against Sakon/Ukon for Kiba, Gaara against Kimimaru for Lee, Temari against Tayuya for Shikamaru. 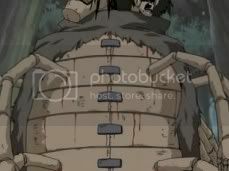 There wasn't much action between Gaara and Kimimaru at first, then Kankuro is doing well against Sakon/Ukon and locked him using his puppet technique and stabbed him. Temari is doing great with Tayuya too, her speciality, wind is very effective against Tayuya's sound. 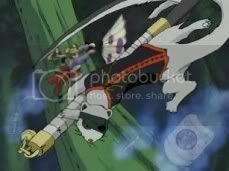 Using her wind, Temari blows any attack by Tayuya's flute. Very cool! Their appearance was darrrrrrrnnnnnn cool!!! 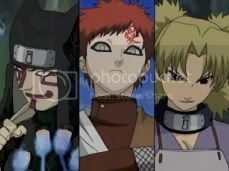 Especially for Gaara hahaha, he's so cool in the 3 parter, the 3rd screenshot! Manz. Ok end of Naruto, on to today's happenings ... hmm actually nothing much hahaha i didn't watch any animes today ... aiya later i'll watch Jinki:Extend Ep11 and Ep12 after i watched Last Exile and Shaman King on Arts Central ... oh yeah Shaman King looks so cool! Uh and ... oh i haven't written TCZ II #23 review yet ... oh my gooooddd! Hahaha, aiya after i type la ... Oh yes, speaking of TCZ II ... TCZ II #26 is coming out tomorrow!!!!!!! YAYAYAYAYYAY! Finally Wang Chan makes his first debut in TCZ II!!!! *Sobs ... after 25 vols* hahaha ... he looks .. well ... okok, but he lost the ... uh let's see the like cool and calm air in him le, he seems more reserved and protective like tat. Yeah. Anyways, i'll be writing the review for #26 tomorrow if i get my paws on it hahaha or on friday ... most likely i should get it le ba ... so if i dun get it tomorrow, i'll rush to write #24 and #25 review so tat #16-#26 will be completed! Yay. Uh how about #1-#15? lol later. I'll write one review each day or each two days lor ... yeah depends. Heh. Ok cya i go write le! Stay tune for more TCZII #26 spoilers goodies tomorrow if i get it, of course. Hahaha.. cya cya!